So, I've taken my wife to the range more than a couple times and she has shot all of my pistols except my 44mag. She really likes my Glock, Shields and XD but she does have a difficult time with racking the slide and with limp wristing the pistol. Couple times we rented a 4" S&W Model 60 revolver and really like it and she shot it well. I've asked her if she would like here own pistol or revolver and she has always declined. Well, she literally woke up one morning about 4 weeks ago and said "I want a revolver." She couldn't elaborate on if it was a dream or what but she now is fully on board in getting a revolver. We went around to several of the better LGS in the area and had her fondle some of the airweights and the Model 60, 640 and 649. She decided she like the heavier feel of the Model 60 and wanted the exposed hammer to utilize single action as well as DA. She is now getting a nice new Model 60 for her birthday coming up in early February. I'll work with her at the range and make sure she is full capable of using the revolver for home defense if needed. Once we move back to OK she'll get professional training and then take her CCW class. Here's my question. I have plenty of good 44mag ammo for my Colt Anaconda but need some opinions on 38spl and 357 loads. I want her to shoot both calibers but think I need ot look at a quality 38spl hollow point or a good +P load. What grain should I be looking at for her? 125gr, 158gr? What do you shoot for training/plinking and for personal defense? If you have a good holster recommendation for CCW chime in as I will also be using that on occasion for myself to carry. Something quality and leather? I love J frames, and from a different perspective, the heavy trigger pull can be both a good training aid hidden under the guise of being slightly harder to ND. Of course we know keeping the finger off the trigger is how we avoid most NDs but some newer shooters need acclimated to the fact that it is not going to fire on its own. "...but she does have a difficult time with racking the slide and with limp wristing the pistol." I have heard the above countless times and the majority of the time it was nothing more than the utilization of bad technique. The fact that the gun is intended for the purpose of self defense but her choice was made in a much different context is disappointing. Nothing like a dose of context to open the eyes. She likes a revolver, and the 'expert's start castigating her--how predictable. If the guy is looking for ammo ideas, the Gold Dot 135gr Short Barrel load has proven itself in the real world, and recoil is as easily manageable as the semiautos he mentioned that she likes. If they still make them, the Buffalo Bore HCWC Gas Check load (or I might be thinking of Underwood) wouldn't be bad, either; maybe a bit blasty (a technical term), but otherwise not a bad choice. Sometimes the term 'Idiot' is a description and not an insult. She likes the revolver. That might very well be true. I like revolvers as well. I'd be interested is knowing where you found the information you shared on the ammunition. Like is a funny thing. Yes, until we put ourselves in a situation that's as close to an actual critical incident there's kust no real way to know if the tool, technique or whatever will actually perform. If anyone can argue that please do. I gave a box of the 135 GDs to a friend of my wife for carry and I also "downloaded" some .357s for her to practice with. She also wanted a small revolver. Not exactly my favorite weapon, but I figured I could help her make he best of her choice. ace I agree in part and disagree in part. The GDHP load you mentioned is a very good choice, but the other load(s) you mention sound like they might be too hard to control, especially out of a J-frame. I think that the K-, or L-frame would be a better choice as they would be a lot more controllable. That, BTW, is the main reason that my EDC is not a J-frame. What info brought you to that conclusion? The GDHP 135 gr. SB is very "blasty" and has strong recoil in a J-frame. I've shot it out of a J-frame, and it hurt like the Dickens, you don't want to shoot anymore of it than necessary. I'd recommend trying different grips to tame the recoil. I recently fondled a new 442-1 at my LGS, and S&W had put some really nice ergodynamic rubber grips on it, at least they fit my hand well, and as they say, YMMV. I was looking at that Buffalo Bore HCWC recently on their website, and I'd like to try it out and see how it shoots. I think a hard cast wadcutter may be a better defensive round as it will definitely cut a .358 size hole, unlike some JHP's that plug, don't expand and end up behaving like the "widowmaker" lead round nose, making a wound channel that closes up and only oozes blood slowly. 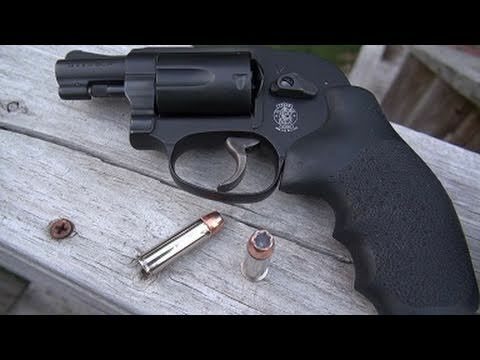 I think "blasty" is pretty much the norm out of a snub nose revolver as far as common SD ammo is concerned. All times are GMT-1. This page was generated at 22:50.